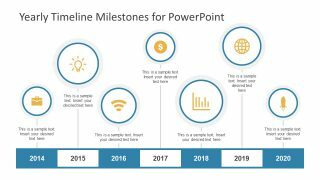 The Yearly Timeline Milestones for PowerPoint is an outstanding design of cool infographics and icons. 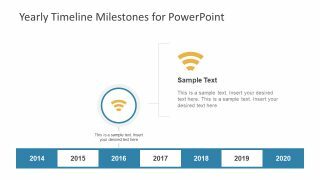 The timeline planning template has the horizontal path of vector icons as labels for each year/phase. The timelines are necessary tool to track the progress and easily deliver the valuable information. 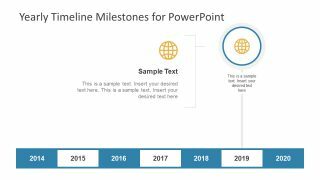 Particularly for the meetings with business executives, the presenters need a visual aid for audience to comprehend the project progress. 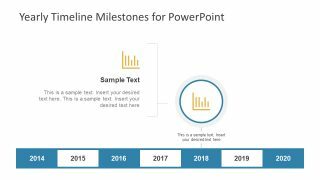 This timeline PowerPoint with milestones creates an easy-to-digest roadmap of project activities, events or statistics. 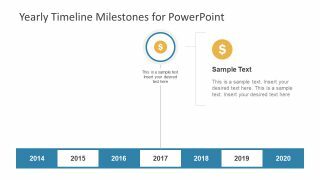 Further, these project timeline templates are easy to use and modify as require. 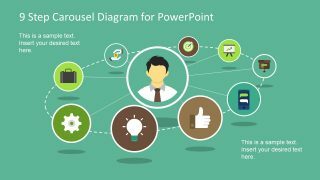 The use of circular infographic icons provides a sequence structure and how to communicate it to viewers. These include, briefcase, lightbulb, WiFi, Dollar symbol, bar chart, globe and rocket launch. 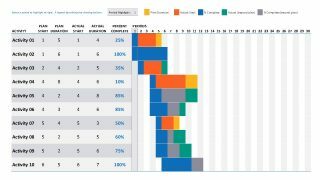 Moreover, the 7 phases here display the yearly advancement which can also customizable to present processes. 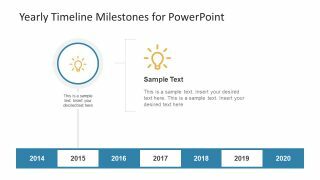 The 8-slide template of Yearly Timeline Milestone for PowerPoint is a business management presentation for planning and scheduling. 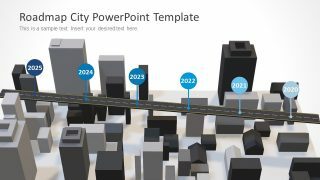 It is an editable PowerPoint of cool infographic icons with assists users to customize various design features. 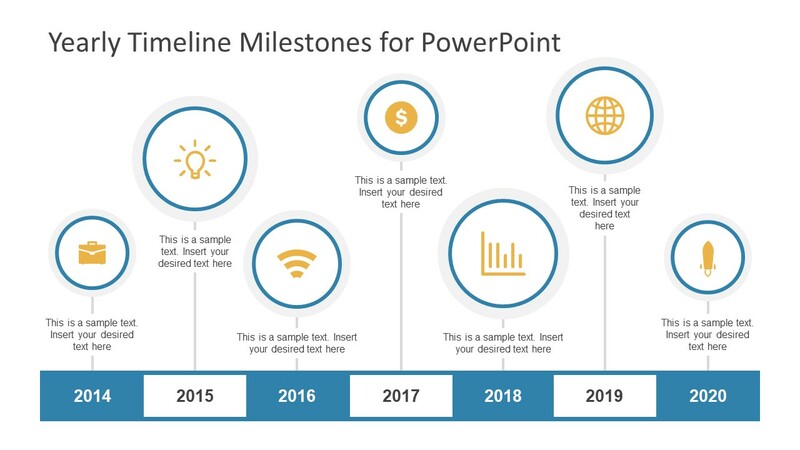 The subsequent slides of the milestones PowerPoint help the audience to focus on one segment of the timeline at once. 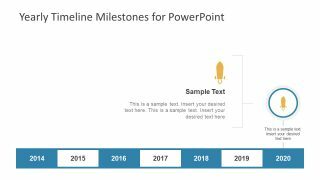 This timeline PowerPoint with milestones has various presentation options. Such as, project forecast, monthly, quarterly and yearly progress reports, Gantt chart, goals and objectives etc. The timeline diagram presentation is suitable of all the business and industry needs to explain numerous perspectives. 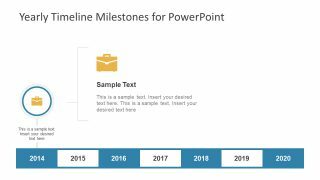 The timeline of yearly milestones is an awesome PowerPoint for project timelines and a creative way to tell a story. This presentation helps audience to overview the past, present situation that reflects the prediction of future. Furthermore, to customize the yearly milestone timeline, users can modify the figures in drawing format menu. 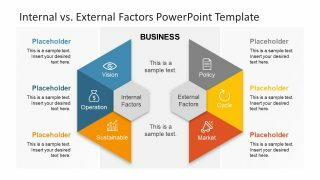 For example, change the shape fill color, resize the infographic icons or adjusting the position of objects in PowerPoint.